With its start from the Department of Highways as an upgraded US 22, Interstate 78 became one of the first Interstates in Pennsylvania to get the familiar red, white, and blue shields. In 1950, the section from the Lebanon County line to Exit 13 was upgraded, while construction began on the section from Exit 13 to Exit 17. That section was completed in 1951. In 1952, construction began on the Lehigh Valley Thruway from the current interchange with US 22 to New Jersey. In 1954, the highway was under construction from Exit 17 to Exit 19. That same year, the first section of the Lehigh Valley Thruway opened to traffic from west of PA 100 to the PA 987 interchange. The remainder of the expressway from PA 987 to New Jersey opened in 1955. Also that year, the section from Exit 17 to Exit 19 opened to traffic. Construction began in 1956 on the section from Exit 23 to Exit 30, and in 1957 from Exit 30 to the Lehigh County line. Those two sections opened in 1958 and the following year, the section from the Berks County line to west of PA 100 opened. In 1964, several sections were on the drawing board. The first section was from Interstate 81 to Fredericksburg, and the other was from the current PA 248 interchange south and east around Easton and into Phillipsburg, New Jersey. In 1965, the proposed new alignment was extended from Fredericksburg to the Berks County line. At that time, Interstate 78 would have gone south of the borough closer to the US 22 alignment. In 1968, construction began from Interstate 81, which was itself under construction, to the Berks County line. In 1968, the NIMBYers in Phillipsburg, New Jersey successfully fought I-78 coming through their town. This was for the best since there are several dangerous curves on the Lehigh Valley Thruway near Easton. In 1969, the Department of Highways proposed a new Interstate 78 alignment to leave between Exit 45 and Exit 49, travel south and turn east near Emmaus and continue south of Allentown and Bethlehem. It would cross the Delaware River north of Raubsville, Pennsylvania. The section from Interstate 81 to the Berks County line opened to traffic in 1970, and it would be the last new section of Interstate 78 to open for 19 years. The first exit numbers to appear on the 1975 PennDOT map showed Interstate 78 with mileage based exit numbers, which reappeared in 2001. The last time mileage-based exit numbers were shown on Interstate 78 was on the 1978 map. Construction finally began in 1984 on the long-awaited southern bypass of the Allentown-Bethlehem-Easton area, from PA 309 east to New Jersey. New Jersey DOT took over construction of their missing link from the toll bridge to US 22 east of Phillipsburg. In 1986, the connection from the US 22 interchange to PA 309 was still proposed, with construction beginning on it in 1987. The project was not without tragedy as during the five years of construction, four workers lost their lives. The new 32-mile-long, $402 million section of Interstate 78 along with the 1,222-foot-long Interstate 78 Toll Bridge opened to traffic on November 21, 1989, thus finally completing Interstate 78 in Pennsylvania. At the ribbon-cutting ceremony, Governor Robert P. Casey said, "Completion of I-78 represents a major achievement for Pennsylvania, for our neighbors in New Jersey and for the nation. It represents a new road to opportunity for Lehigh Valley companies to grow and prosper. We open new arteries for safer, better access for the thousands of commuters who travel to work each day in a resurgent Lehigh Valley economy." This was just one of many expressways in Pennsylvania that sat on the "drawing boards" for 30 years but not started until the 1980s. In May 1990, Federal Highway Administrator Thomas D. Larson, a former Pennsylvania Secretary of Transportation, had his first opportunity to drive on the new Interstate. Recalling the "decades of acrimonious debate and delay," he said that building the missing link "involved major compromises, attention to environmental concerns, and careful consensus building." He added, "It is really amazing just how superior this road is to older Interstates." The benefits of the new alignment were noticed right away, when as much as 20% of traffic that had used congested, old US 22 moved to the new Interstate. By opening the new alignment, it had become the "express" route and US 22 reverted to being a "local" route. Wednesday, February 14, 2007 will be remembered more for the snow and ice storm than romantic evenings for most of eastern Pennsylvania. Even those just passing through, or attempting to, on the Interstate won't soon forget Valentine's Day 2007. As conditions began to deteriorate with seven inches of snow followed by three inches of ice, several tractor-trailers began to jack-knife and smaller accidents occur which blocked the westbound lanes west of Allentown. PennDOT estimated at one point that hundreds of tractor-trailers were stuck due to conditions, running out of fuel, or fuel freezing. More than 130 National Guardsmen began using Humvees and other vehicles around 9 PM to help control traffic, pass out food, blankets, and baby supplies and rescue motorists. Police took fuel and food to some motorists. Department of Transportation crews began to block off parts of I-78 around 8 AM on Thursday but more traffic continued to get into the gridlock because other entrances were still open. State Police did not close all of the ramps from Exit 19 to Exit 49 until around 5 PM, more than 24 hours after the initial vehicles began to get stuck. By 9 PM, PennDOT said all motorists had been cleared off I-78, but there were still vehicles being towed off the Interstate. The storm and the problems it caused forced Governor Ed Rendell to declare a statewide disaster emergency which authorized state agencies to use all available resources and personnel to assist in relief. It took 150 employees with 141 pieces of equipment to clear the ice and snow off I-78, I-80, and I-81. Another stipulation of the emergency declaration was halting toll collection on the Pennsylvania Turnpike to help in cross-state travel from February 15 to February 17. At 4 PM that day, Interstate 78 reopened to traffic. In the wake of the mishandling of the storm, a bipartisan House committee was formed and a state-ordered investigation begun. Two hearings would take place between February 22 and 23, but several high-ranking state officials including Secretary of Transportation Allen Biehler and State Police Commissioner Colonel Jeffrey Miller stepped forward on February 21 to accept responsibility. Gregory C. Fajt, a senior adviser to Governor Rendell who helped begin a preliminary investigation, said, "We didn't execute well in the storm's early states, and didn't escalate our response when we fell behind in some key areas." James Lee Witt Associates, a firm headed by the former FEMA director, was hired to conduct a separate review of the response. After the February 2007 storm and aftermath, it was determined that something would have to be done to prevent travelers from being stranded on the Interstate. What you might notice in the above pictures, one side of I-78 is clogged with traffic but the other is clear with the only problem being the Jersey barrier. Work to rectify that problem started on September 8, 2009, by installing movable median barrier gates at five points in Berks County between Exit 19 and the Lehigh County line. The gates allow emergency personnel to open the median so the Pennsylvania State Police can divert traffic from one side of the Interstate to the other side in the event of an emergency closure. The project cost $1,027,000 million and finished in December. Fortunately the movable barrier wasn't needed when the next big storm hit on February 9, 2010, as Governor Rendell took proactive measures and closed I-78 at 12:30 PM the following day. In a press release he stated, "For your safety, do not drive. You will risk your life and, potentially, the lives of others if you get stuck on highways or any road. The National Weather Service issued blizzard warnings for several counties in Pennsylvania and visibility is at or near zero. Motorists must stay off Interstates 81, 83, and 78 until my administration lifts the restriction," which happened on February 11. Another project to help traffic flow was getting off the drawing boards as well around the same time as that one. The I-78 Open Road Tolling (ORT) Project at the Interstate 78 Toll Bridge in Easton began with a $4,786,000 design-build contract being awarded to A.P. Construction of Philadelphia on September 29, 2009 for partial demolition and removal of a section the canopy of the existing toll plaza; new overhead sign gantries; design fabrication, and construction of a canopy over the new ORT lanes; design and construction of a concrete barrier to separate the ORT lanes from the regular toll lanes; lane restriping of the Interstate; and design and construction of electrical systems at the toll plaza for the ORT equipment. Then on November 23, 2009, the Delaware River Joint Toll Bridge Commission awarded a contract in the amount of $764,945.62 to Hill International, Inc. of Marlton, New Jersey for construction and inspection services for the project. Construction began January 8, 2010 and required removal of three toll collection lanes on the left side of the existing plaza which originally consisted of seven lanes which caused congestion during weekday evening rush hours. Relief for westbound travelers came on May 13, 2010 when the two Open Road Tolling, or sometimes referred to as Express E-ZPass, lanes opened to traffic allowing it to continue through the plaza at highway speeds while still paying the toll. They opened 13 days sooner than expected, but the entire project didn't finish until June 30. The ORT lanes won a 2011 Diamond Award Certificate for Design Build Services from the American Council of Engineering Companies of Pennsylvania. After the snowstorm in February 2007, and the changes that took place in the wake, it seemed weather would no longer pose a problem for drivers on Interstate 78. 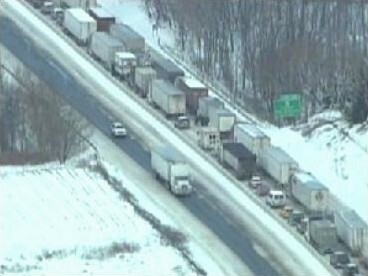 However, drivers would again become stranded on the Interstate when another winter storm hit in January 2011. Late in the evening on January 26, several tractor-trailers became disabled in the westbound lanes south of Allentown. Interstate 78 was closed into the early hours of January 27 with westbound traffic detoured north on PA 33 and west over US 22. "Most of the motorists who were stuck in the back-up are getting moved out. We have plow vehicles there treating the roads. Where the closure was, the commercial vehicles, most of the vehicles, have been moved out and we're getting the road in shape for travel as we speak," said PennDOT spokesman Ron Young around 12:45 AM Thursday morning. A new safety feature began to be installed along the Interstate in 2009. Cable guard rail, a modern version of the old wire guard rail, was being installed in the grassy medians of Interstates statewide, and Interstate 78 was no different. "It will catch the vehicle and slow the vehicle down and actually absorb some of the energy from the force of the vehicle," said PennDOT spokesman Ron Young. The section from Exit 60 to the New Jersey state line saw the new barriers being installed and not a moment too soon. In September 2010, two tractor trailers and a car collided near Hellertown, resulting in three injured and one killed, and in January 2011, a life was taken when a vehicle crossed the median into traffic in the opposing direction. Safety has always been an issue on the outdated section that comprises the multiplex with US 22. It was not questioned as much as on May 12, 2014 when a fiery chain-reaction crash involving seven vehicles in the eastbound lanes at mile marker 41.4 near the Berks/Lehigh County border killed three people. Around 1:15 PM, a tractor-trailer rear-ended a car as it attempted to pass a box truck, which initiated the accident which caused three of the vehicles to burst into flame. The westbound lanes were closed until 5:30 PM, while the eastbound lanes did not reopen until 10:30 PM. The tractor-trailer driver, who received a summary offense, and 11 others were taken to local hospital for treatment. The accident was not a surprise according to PennDOT, who commented that the section is notorious for aggressive driving. "The fatality rate is 41% above the state average and the overall crash rate is 71% above the state average," said Ron Young, spokesman. Snow squalls have been a problem on I-78 when they hit the eastern part of the state on the morning of February 13, 2016 and the afternoon of January 30, 2019. The former caused a 64 vehicle pile-up, including 12 tractor-trailers, and resulted in the death of three and 73 injured at mile marker 7.5 in Lebanon County. First responders battled subzero wind chills and wind gusts up to 40 MPH. Buses were brought in to transport the uninjured to the Jonestown Perseverance Fire Company, while the injured were sent to 11 different hospitals. Around 21 fire and EMS companies, in addition to four helicopters, from Lebanon and surrounding counties responded. The Interstate was reopened around 24 hours later on February 14. The latter white out resulted in a 14 vehicle pile-up, eight of which were tractor-trailers, around 2:45 PM at mile marker 32.4 westbound in Berks County. Unlike the earlier pile-up in 2016, there were no fatalities and only three were injured. The westbound lanes reopened around 7:30 PM that night. Even before then, an early season snow storm crippled travel throughout the Lehigh Valley on November 15, 2018. The storm dropped 7.4 inches of snow at Lehigh Valley International Airport and caused travel headaches on Interstate 78, causing motorists to be stuck for 12 hours. 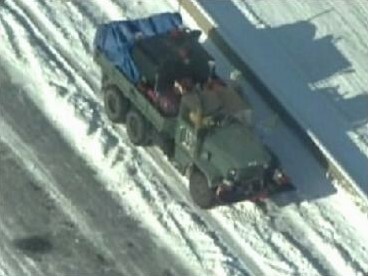 Disabled vehicles including tractor-trailers were blocking the highway from the New Jersey state line to PA 100. Not all were due to accidents, but ones running out of fuel, dead batteries, and even sleeping motorists. The latter of which required police driving in the eastbound lanes, honking their horns trying to wake them up. Page updated February 07, 2019. Information courtesy of the Pennsylvania Department of Transportation, Federal Highway Administration, Delaware River Joint Toll Bridge Commission, KYW-TV Philadelphia, WPVI-TV Philadelphia, Reading Eagle, WFMZ-TV Allentown, the Harrisburg Patriot-News, the Allentown Morning Call, the Easton Express-Times, Rand McNally, and David Greenberger.